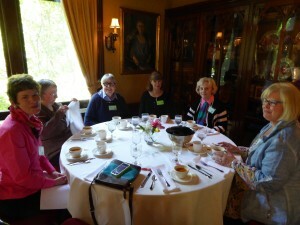 The Woman’s Century Club enjoyed a presentation by guest speaker David B. Williams at our September meeting. 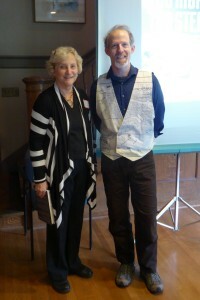 David uses his education and experience as a geologist to write about the interaction between people and the natural world. He discussed his newest book, “Too High and Too Steep: Reshaping Seattle’s Topography.” David is pictured here with Club member, Michele Genthon, who introduced him. 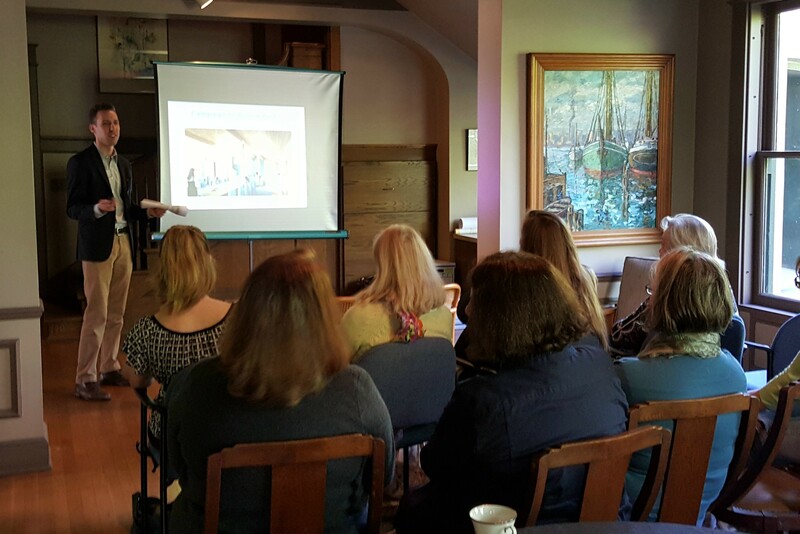 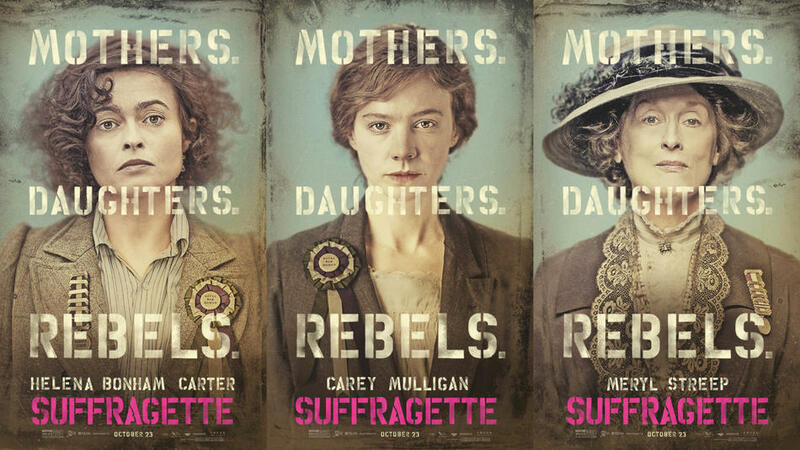 Members Only Event – Sneak Preview of the film “Suffragette,” starring Carey Mulligan, Helena Bonham Carter, and Meryl Streep, at the SIFF Uptown. 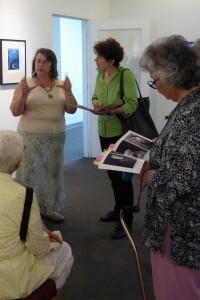 Question and answer period with director Sarah Gavron afterward. 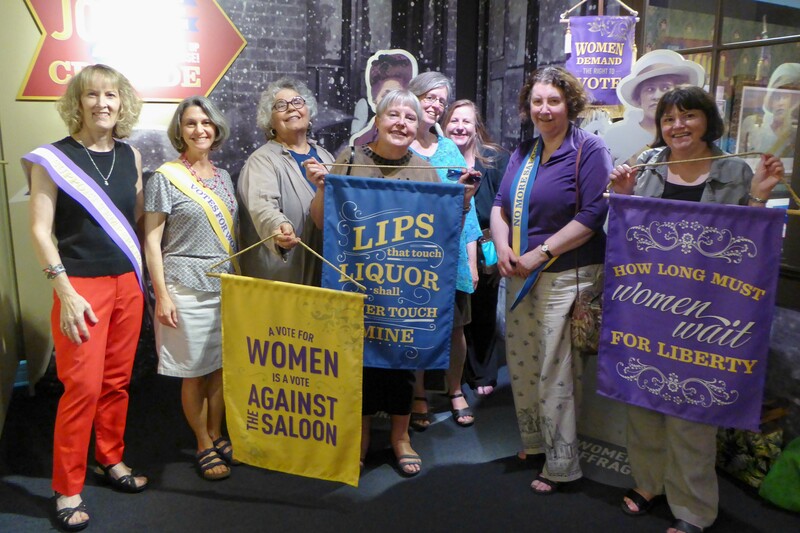 Members Only Event – Private tour of the Museum of History & Industry (MOHAI) exhibit, American Spirits: The Rise & Fall of Prohibition. 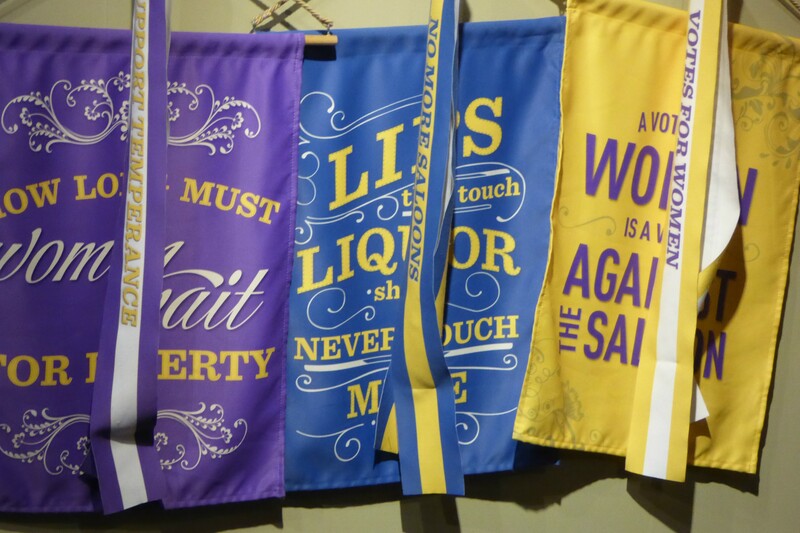 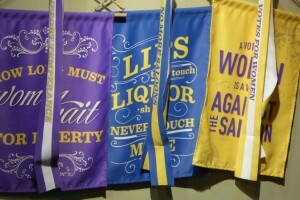 Women’s Christian Temperance League banners. 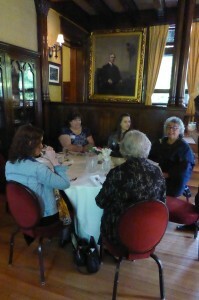 Woman’s Century Club members enjoy the tour! 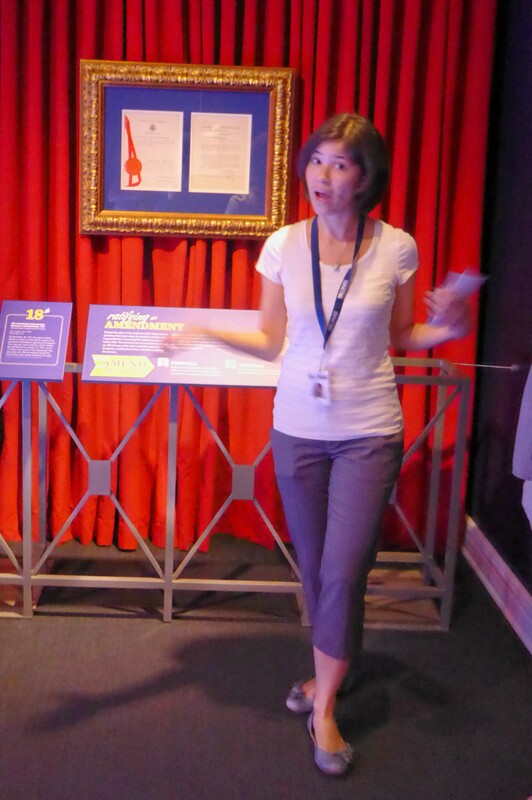 Our tour guide, Meris Mullaley, MOHAI Adult Public Programs Assistant. 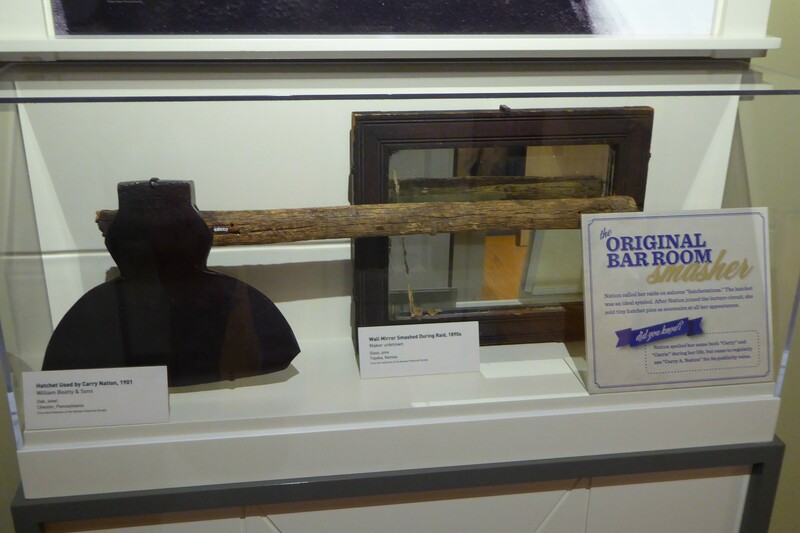 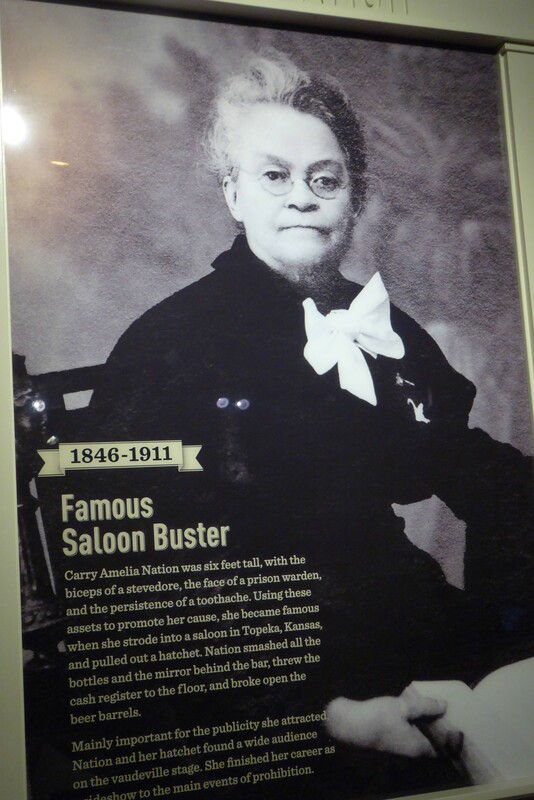 Carrie Nation (1846-1911), a radical member of the temperance movement, was known for attacking saloon bars with a hatchet! 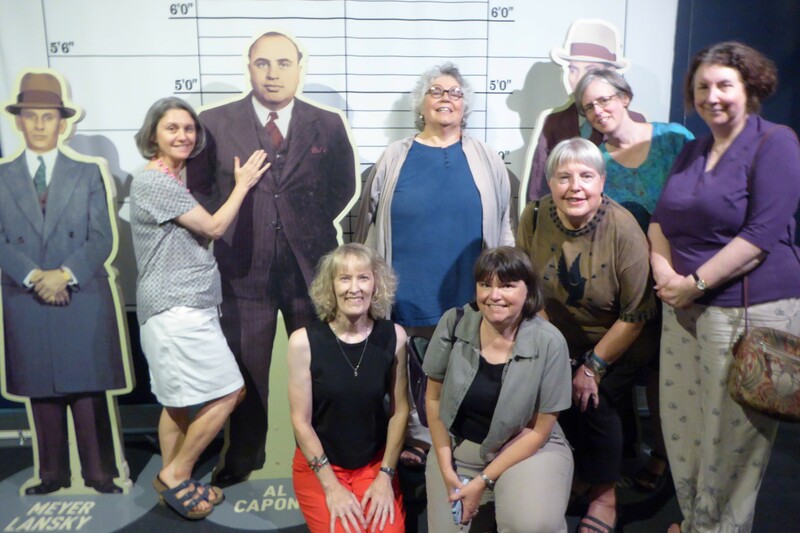 Members of the Woman’s Century Club pose with Meyer Lansky, Al Capone, and Lucky Luciano. 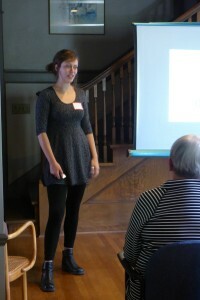 Guest speaker Arielle Lawson of Capitol Hill EcoDistrict. Capitol Hill EcoDistrict is a neighborhood-based sustainability initiative led by Capitol Hill Housing. 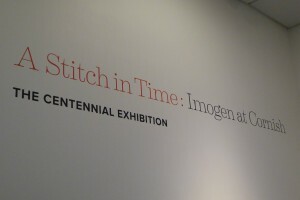 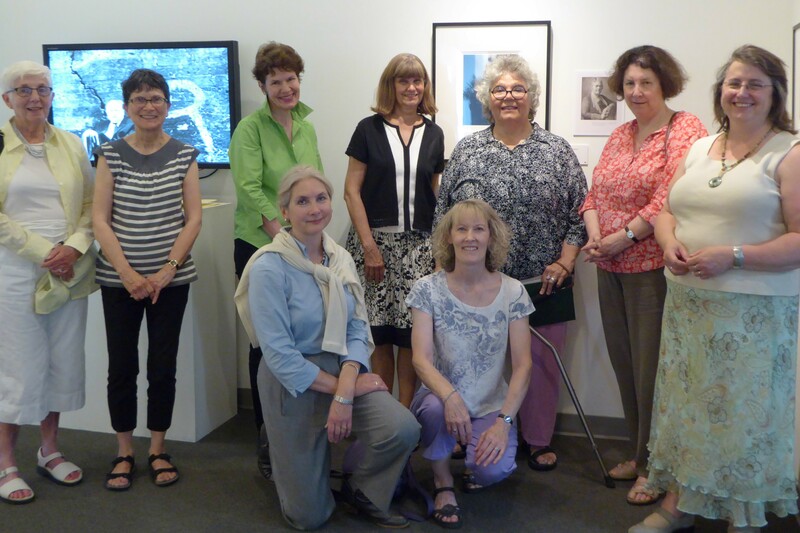 Members Only Event – Private tour of the Imogen Cunningham photography exhibit at Cornish College of the Arts. 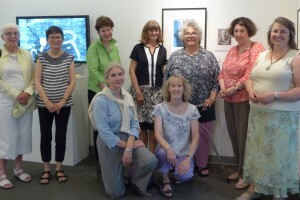 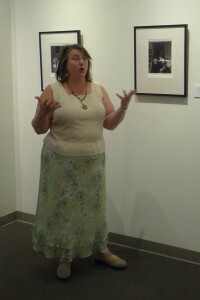 Tour led by Visual Arts Librarian and exhibit curator Bridget Nowlin. Members and guests enjoy a delicious luncheon prepared by member Judy Suhr and served in the library of the Stimson-Green mansion. The Club’s butler and go-to man, Michael McCullough. 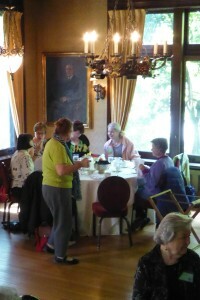 This was Michael’s last event with the Woman’s Century Club. 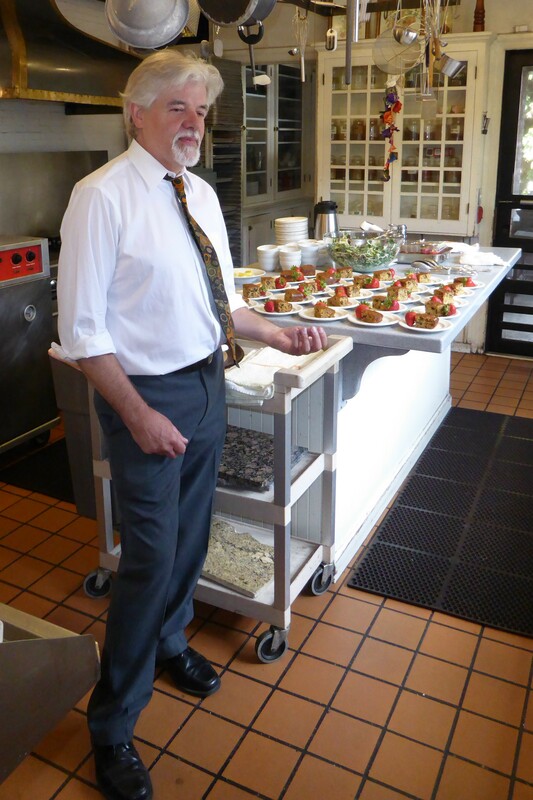 He is retiring, after 43 years with the Club. 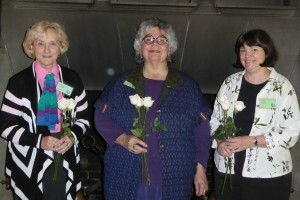 New members L to R: Michele Genthon, Sara Patton, and Cindy Hughes, receive their white roses and are welcomed into the Club. 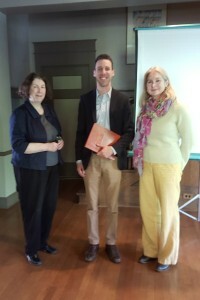 Guest speaker Chris Veltri, Development Associate at Ryther Child Center. Chris Veltri with Mimi Sheridan, President (left) and Patty Moe, Treasurer (right). 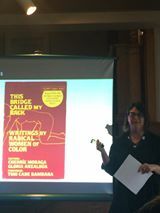 Dr. Amy Peloff, Affiliate Assistant Professor of Gender, Women, and Sexuality Studies at the University of Washington, spoke on non-traditional feminist Erma Bombeck in a presentation titled, This Bridge Called My Vacuum: Creating Space for Housewives in Second Wave Feminism. 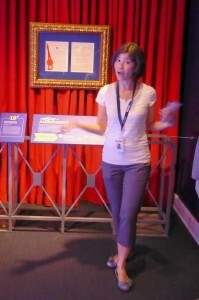 Dr. Amy Peloff. 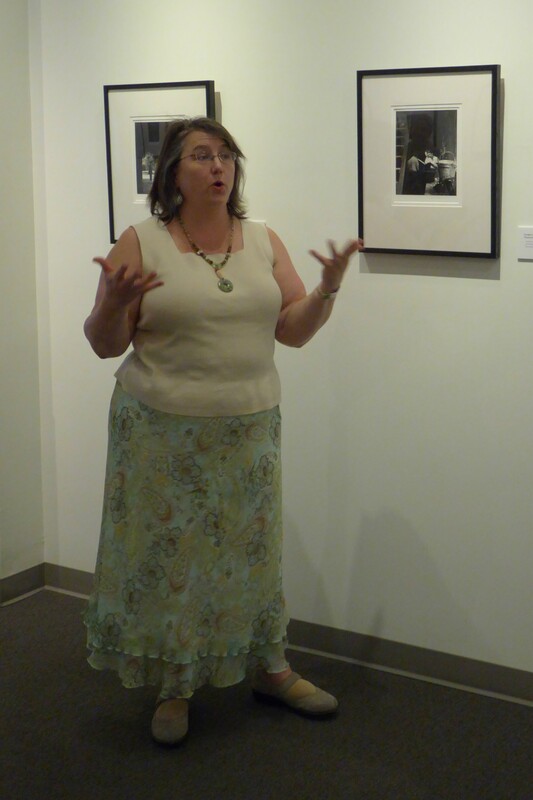 Photo by Cynthia Anderson. 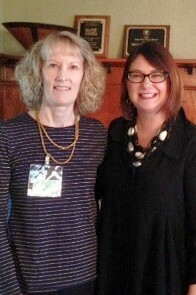 Saundra Magnussen Martin, Corresponding Secretary, with speaker Amy Peloff.